Neal Moglin presents his partner, Ald. 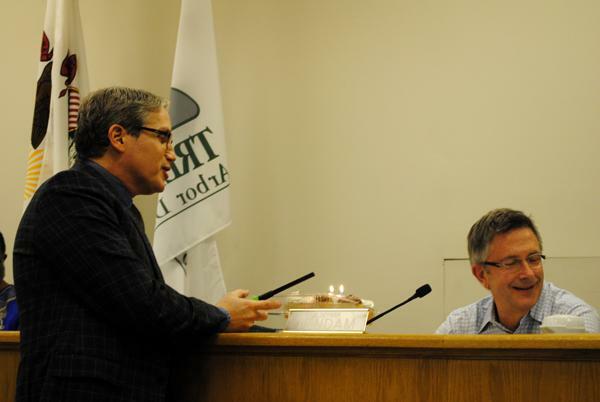 Mark Tendam (6th) with cupcakes to celebrate his 59th birthday Monday at City Council. City Council discussed options Monday to renovate or replace the Robert Crown Center. A subcommittee met to consider the financial costs associated with the pending project, which may receive an Illinois Department of Natural Resources grant worth $2.5 million. City Council passed a resolution Monday evening to authorize the grant application. Assistant city manager Marty Lyons presented a 30-year projected cost analysis gauging project costs for various options including a renovated facility, a new facility with a separate ice rink and a community center and replacement facility. Renovating the Crown Center would cost about $17 million. The building would be a gut-rehab project and extend the center’s life for 20 years, Lyons said. Net 30-year costs for a new center range from $44.3 million to $85.2 million. Lyons told The Daily the city would pay off debt over the next 20 years to 30 years using revenue from the center. Tax money will be used to pay off remaining debt. The subcommittee is considering a new center at Main Street and Dodge Avenue with an ice rink, a community center and a library. An additional option would be to separate the ice rink from the community center. Northwestern students would be a potential customer for a new ice rink, Lyons said. Some Northwestern students had tried to use the rink, but could not find playing time, Ald. Don Wilson (4th) said. Ald. Ann Rainey (8th) disputed the notion that the ice rink caters specifically to Northwestern students. In planning upgrades to the center, the subcommittee hired a financial consulting group to assess different center options. The consulting company concluded increased ice availability would not likely increase revenue because of the multitude of ice rinks in the area. In addition to financing center upgrades through the city, the subcommittee has considered handing ownership to a private entity. Such proposals would require the city to act as a backstop, meaning it would ensure funds are raised. Backstop purchasers can receive premium fees for their services. Lyons said he would continue to work with City Council as the city solicits donations from community members for the center. The IDNR grant application is due March 10. If an ice rink is foreclosed, Lyons said, it generally would continue operating. The International Ice Centre in Romeoville, Ill., went into foreclosure after it was built for $17.5 million and was bought for about $3 million. “The places we went to, there were some that were money makers but we weren’t going to look at them and say they were the nicest looking place I’ve ever been in,” Lyons said.